Whether you are a football fan or not, no one wants to miss the opportunity for a big party. Especially in the winter when there isn’t a lot to look forward to, the Super Bowl makes a great excuse to hang out, eat, and do some cheering. 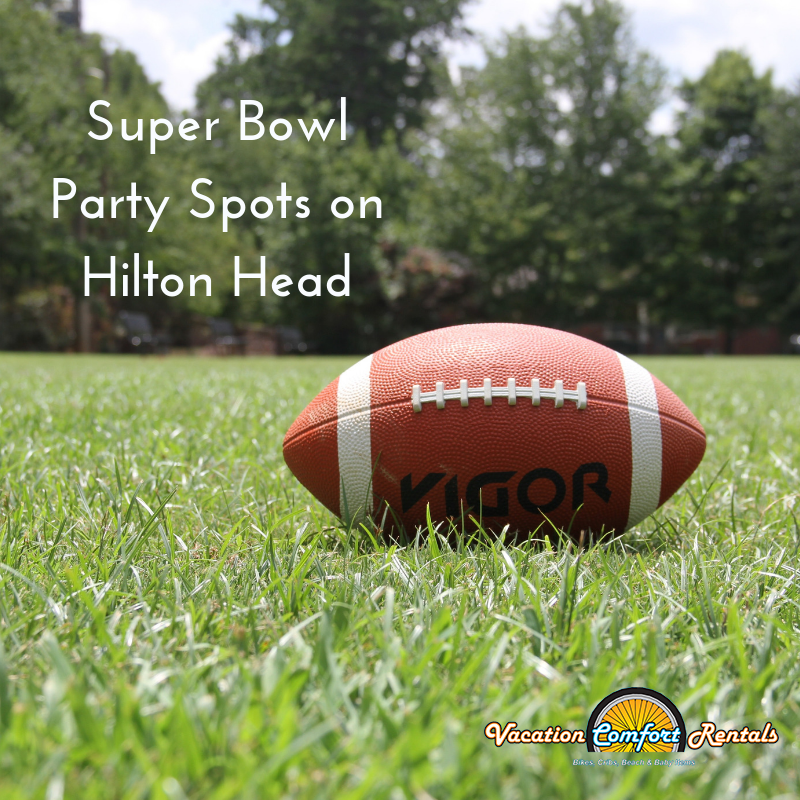 If you’re new to Hilton Head or chose to have your vacation here during the first weekend in February, here’s a few tips on how you can celebrate the big game in style. The Rooftop Bar at Poseidon offers an all-you-can-eat buffet with drink specials. You won’t miss a single play while watching the game on their 16-foot wall. The party is first come, first served, so get there early and bring your appetite. Head over to Brody’s Bar in Beaufort at kick-off if you are looking to watch the game on a more personal-sized TV. Brody’s has 27 televisions, and they offer great specials on wings and other appetizers. Super Bowl Party at FISH! The trendy restaurant found at Coligny Plaza on Hilton Head Island treats the big game with style. You’ll find specials tailored to the participating teams’ hometowns on the menu. And bring the kids to enjoy the kids’ menu and play area. Are you so into the game that you don’t want the disturbance of people walking around? Then what better place to go than a movie theater to see every down on the biggest screen in town. Admission is free, and food and drink specials are available at the Cinema Bar. Enjoy the game time food and drink specials here at the Smokehouse on Hilton Head Island or get great deals on catering-sized take out that you can bring back home for hosting your own party. Would you rather be out playing than sitting around eating? Or maybe you want to be active so that you can sit around eating later. Head over to the Sanctuary Golf Club in Beaufort with your partner to play a few holes. Be sure to reserve ahead of time. There will be food and fun, but you’ll still be able to get home in time to watch that other sporting event of the day. And if we can do anything to make your stay on Hilton Head Island more comfy, from crib and rollaway bed rentals to bicycles for getting to and from all the fun, don’t hesitate to let us know!